What's New at NDC Editions, Inc. Check here for news of forthcoming new releases in our series of award-winning choral publications! On Friday, May 9th, and Saturday, May 10th, the first Jubilation: WCLV/United Church of Christ Church Choir Challenge took place at Pilgrim Congregational UCC Church in Tremont,Ohio and were broadcast live over the two evenings on WCLV, Cleveland's fm station for classical music. Winning the First Prize of $1000 and a trophy was Cleveland's Choir of St. John the Evangelist directed by Greg Heislman. Included in the winning program was In Monte Oliveti, the first of Ralph W. Buxton's Three Tenebrae Responsories [NDC 032]. 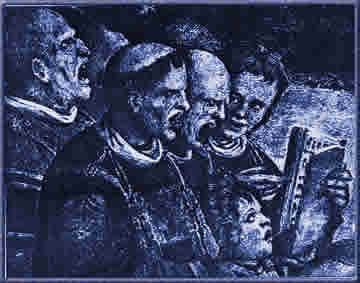 You may purchase a recording of this choir performing In Monte Oliveti and Tenebrae factae sunt at their website. Two of our publications, NDC044 and NDC059, were included in one of the scheduled choral reading sessions at the ACDA 2008 Eastern Division Convention held in Hartford, Connecticut from February 13-16, 2008. "These editions are absolutely spectacular -- based on solid research, with titles selected for their quality and great beauty. The scholarship demonstrated by the editor, Ralph W. Buxton, justifies the somewhat higher cost of these editions. His research and editorial commentary are valuable enough that one might consider using a less expensive edition for the singers, while using a Notre Dame edition for program notes. The entire series matches the quality and fine editing of the difficult-to-obtain Arista publications of some similar classic works." "Overall, then, this is a worthy series, one that makes individual titles by Jacob Obrecht, Clemens non Papa, Heinrich Isaac, Thomas Tallis, Adrian Willaert, Orlando di Lasso, William Byrd, and several other Renaissance composers accessible, some for the first time. I hope the series will continue to add to its list of titles, and I would happily encourage their use." One of our publications, NDC045, was included in one of the scheduled choral reading sessions at the KCDA Summer Conference held in Topeka, Kansas from July 8-10, 2004. The Washington ACDA Summer Institute held at the University of Puget Sound in Tacoma, WA from July 30-August 1 included several Notre Dame Choir Editions [NDC005, NDC008 & NDC024] in their choral repertoire reading sessions. Co-sponsored by the Washington chapter of the American Choral Directors Association, the School of Music at the University of Puget Sound, and Pepper at Ted Brown Music, this year's institute featured Dr. Anton Armstrong, conductor of the famed St. Olaf Choir, as the headline clinician. Each year outstanding examples of graphic design are selected by a committee of the MPA to be honored by the Paul Revere Award for Graphic Excellence. This award acknowledges publishers for their efforts in creating art for the music industry. NDC Editions submitted 5 entries for the 2003 Paul Revere Award and all 5 were collectively awarded a Special 2nd Prize in the Folios (Vocal Scores) category at the MPA Annual Meeting held June 17, 2003 in New York City. The prize-winning publications were NDC024, NDC048, NDC052, NDC057 & NDC059. Learn more about the Paul Revere Awards at the MPA web site. One of our publications for male choir, NDC029, was included in one of the scheduled choral reading sessions at the 2003 ACDA National Convention held February 12-15, 2003 in New York City. Each year outstanding examples of graphic design are selected by a committee of the MPA to be honored by the Paul Revere Award for Graphic Excellence. This award acknowledges publishers for their efforts in creating art for the music industry. 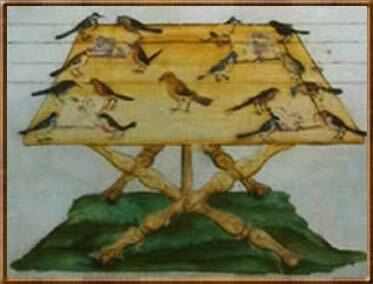 One of our submissions for the 2002 MPA Paul Revere Award received a 3rd Prize in the Folios (Vocal Scores) category. The prize-winning publication was NDC039. Learn more about the Paul Revere Awards at the MPA web site. 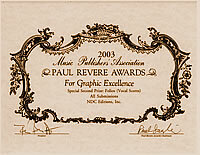 Read an article about the 2002 Paul Revere Awards at the New Music Box web site. This festival, hosted by the Colorado Music Educators' Association, included 2 of our publications, NDC011 & NDC013, in the choral reading sessions.